Liquid Orthotics at a Price you can Afford. "FEEL THE FLOW" call 604-737-3668 for your fitting! Incredisoles can make an amazing difference with your very first step! INCREDISOLES are Liquid Othotics can can make a difference! 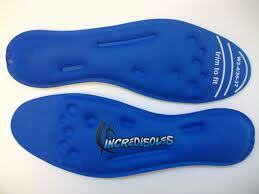 Liquid Centre orthotic insoles conform to ythe shape and contours of your foot... automatically!